Widely considered the best teams in the Atlantic Division, the Tampa Bay Lightning, Boston Bruins, and Toronto Maple Leafs found themselves in the playoffs last season. The Bruins were able to edge out the Maple Leafs in a seven-game first-round series before falling to the Lightning in the second round. A huge reason behind these results was the play of each of these three teams’ goaltenders: Andrei Vasilevskiy, Tuukka Rask, and Frederik Andersen. 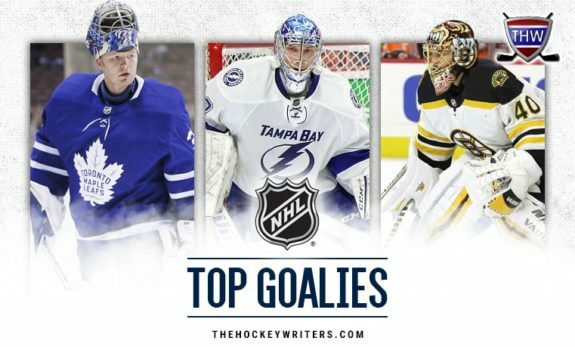 As the 2018-19 campaign inches closer, these three squads are expected to finish atop the Atlantic Division standings and, once again, their goaltenders will play a huge role. Each netminder went above and beyond last year and is expected to build upon those performances. When analyzing their play last season, there is certainly a lot to unpack: statistics, playoff performances, and the defenses they were required to backstop. Rask, Andersen, and Vasilevskiy were undoubtedly the Atlantic Division’s best goaltenders last season, but how did their performances stack up against one another? 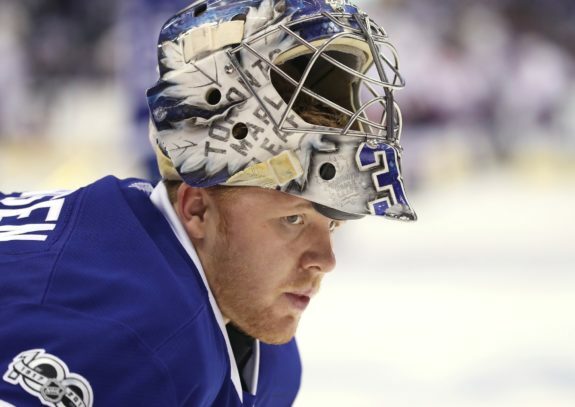 There was a big sigh of relief in Toronto when Andersen nabbed the starting role for the 2016-17 season. That year, the Denmark native produced a 2.67 goals-against average (GAA) and a .918 save percentage (SV%), sporting a record of 33-16-14. It was the most games Andersen had started in a single season (66) throughout his career—a number he matched during the 2017-18 campaign as well. In this latest season, Andersen improved upon his worst statistic from the 2016-17 campaign: his 14 overtime losses. This past year, the Maple Leaf bolstered his record to 38-21-5 and was credited with a career-high save total of 2,029 and five shutouts. While his GAA rose to 2.81, he maintained his .918 SV%, all of which helped him enter the Vezina Trophy debate by the season’s end. While Pekka Rinne ran away from the pack with 129 votes, Andersen received 12, beating goaltenders like Rask, Marc-Andre-Fleury, and Sergei Bobrovsky. Andersen backstopped a defensive corps made up of names like Jake Gardiner, Morgan Reilly, Ron Hainsey, Nikita Zaitsev, and Roman Polak. Their defense wasn’t the highlight of Toronto’s season—especially when compared to their high-power offense – but that didn’t phase the 28-year-old. It was Andersen’s best regular season in his five-year career, but the playoffs painted a different picture and his postseason performance is ultimately the reason why the 87th selection of the 2012 NHL Entry Draft fell to No. 3 on this list. Appearing in all seven games of Toronto’s first-round series against Boston, Andersen was credited with three wins and three losses. He was completely solid on some occasions, especially on home ice, but was unable to consistently thwart the Bruins, including the Maple Leafs’ Game 7 collapse. He posted a .869 SV% and a 3.76 GAA the lowest of his postseason career. If Andersen was able to put on just one more great showing, the Maple Leafs would have skated by the Bruins and into the second round. Alas, this was not the case. Though Toronto’s defense and offense were also inconsistent, a team needs their goaltender to steal a few games in order to net them a Stanley Cup. That was something Andersen was simply unable to do enough of. Rask had a rough start to the 2017-18 campaign, to say the least. In 14 games he allowed 39 pucks to enter the cage, saving less than 90-percent of the shots he faced. This equated to a measly 4-8-2 record. Talks of backup goaltender Anton Khudobin potentially usurping the starting role came to the forefront, but it seemed to spark something within Rask. From December through April, Rask posted a .924 SV%, giving up 86 goals in 40 games. He registered three shutouts and a whopping record of 30-6-3 in that span. Tuukka Rask of the Boston Bruins had a stellar end to the 2017-18 season. (Amy Irvin / The Hockey Writers). The defense in front of Rask was quite the motley crew, consisting of veterans such as Zdeno Chara and Kevan Miller, power-play quarterbacks like Torey Krug, and youngsters by the names of Matt Grzelcyk, Brandon Carlo, and Charlie McAvoy. The mix of experience and inexperience made for inconsistency, as Rask was left hung out to dry on more than a handful of occasions. The biggest argument against Rask is him not always making the saves he needs to make. He was able to consistently thwart the scoring opportunities he was expected to, but it seemed as though when the defense collapsed in front of him he was not always able to bail them out. This is likely why Rask has only been a finalist for one Vezina Trophy (the year he took home the award in 2014), as making the improbable seem probable is a common characteristic among those nominated for the honor. 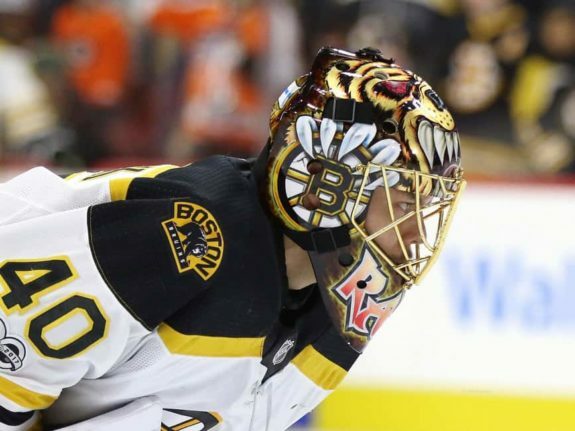 During the 2018 postseason, Rask started 12 games but was only able to snag five wins. His 2.88 GAA and .903 SV% didn’t turn many heads, but he certainly gave the Bruins every opportunity to win. In fact, Boston never lost by more than three goals in their most recent playoff run, and the majority of those two-or-three-goal losses were a result of poor execution at the opposite end of the ice rather than Rask’s play. Still, the Finn is one of the best in the business and was the second-best goaltender in the Atlantic Division last year. Vaislevskiy took the NHL by storm last season. The then-23-year-old appeared in 65 games for the Lightning and came up with a record of 44-17-3. Coupling this with eight shutouts, a 2.62 GAA, and .920 SV%, he earned himself the title of Vezina Trophy finalist. Tampa Bay featured a star-studded roster last season. Their lethal offense featured the likes of Steven Stamkos, Nikita Kucherov, Brayden Point, and J.T. Miller—who registered 18 points in 19 regular-season games with the Lightning. Coupling this with a thorough defensive unit made up of names such as Victor Hedman, Mikhail Sergachev, Dan Girardi, Ryan McDonagh and Anton Stralman who also contributed to much of the team’s success. But all of that means nothing without a great goaltender which is exactly what Vasilevskiy was for the Lightning last year. Even when the team’s dominant lineup failed to own up to that adjective, their netminder picked up the slack. 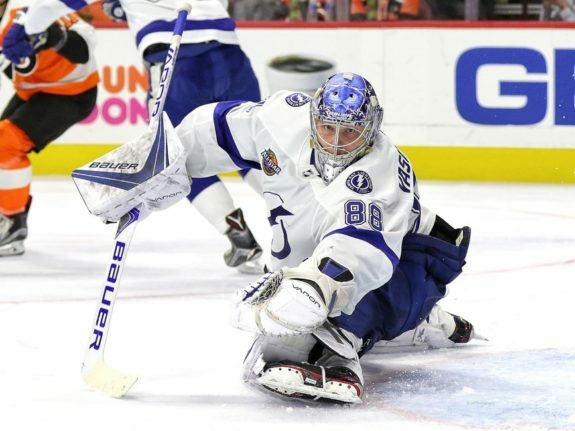 During Tampa Bay’s 17-game postseason run, the Russian netminder posted an 11-6 record maintaining a .918 SV% and 2.58 GAA. In the end, he was unable to halt the high-velocity offense of the Washington Capitals who took the Eastern Conference Finals in seven games. Still, it was a great performance by the Lightning and a sign of things to come from Vasilevskiy who has just turned 24. The Lightning are poised to make another run at the Stanley Cup in 2019, and No. 88 will play a huge role in that push. Vasilevskiy is quickly becoming one of the Lightning’s top young players. He could very well remain the king of the Atlantic Division crease this upcoming season. A frightening reality for Tampa Bay’s division rivals is that Vasilevskiy is expected to improve upon his 2017-18 campaign. If that expectation becomes a reality, Vasilevskiy might just earn himself the Vezina Trophy sooner rather than later.